War knows no end. Its victims are counted in thousands and each day we lose hope… little by little. Food is becoming scarce and our shelter is falling apart. Yet we keep struggling. New faces can be seen around the city – the friendly ones at the makeshift market or in neighboring houses, the hostile ones in the night, with blinding flashlights and clubs and knives. We seek new paths to travel through the ruins – sometimes even underground – just to avoid sniper fire and loot anything of value. It’s never much. Yet we keep struggling. We have no other choice. 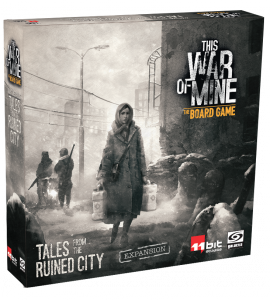 Galakta is proud to announce the upcoming release of Tales from the Ruined City, the first expansion for This War of Mine The Board Game, a story-rich game of survival in a war-torn city. Soon we will publish more information about the expansion including its contents, the date of premiere and ideas that will enhance your gaming experience.